We always hear some questions regarding iPhone message system from our users. Among those, there are two popular: one is how to change the color of the text bubble on iPhone; and another is how to change iPhone iMessage background? These type of question arise as iPhone operating system doesn’t allows users to change the background of the iMessage app. But don’t worry. There is a solution to it: you can easily fix this issue with the help of a third-party app or a jailbroken iPhone. In this article, we will provide you with a guideline on how to change the message or iMessage background of iPhone X/8/7/SE/6s/6/5s with or without jailbreak. Before going to the main part of this article, first you need to know a little about jailbreaking. What is Jailbreaking of iPhone? Jailbreaking of iPhone is a process that helps the users to remove or modify restrictions on iOS device imputed by Apple, which will give more freedom on the using of the device. You can easily jailbreak your iPhone with the help of some iOS jailbreak tools like Evasi0n7 (for iOS 7), Electra and so on. Most of them are free; you just have to download one on your PC, install it and then you can start jailbreaking. However, there’s one thing you should keep in mind, that you have to back up the data of your iPhone before jailbreaking if you don’t want to lose any. Since you acknowledged jailbreak, in the next part, we are going to talk about how to change the background of your iPhone Messages App with or without jailbreak. We want to ensure one thing clearly that Apple does not provide us with any SMS background changing application officially. So, in that case, a third-party app is the only option to customize the colors of your message bubbles on iPhone. Step 1. Go to the App Store on your iPhone and search for “color text messages” in the search page. Step 2. 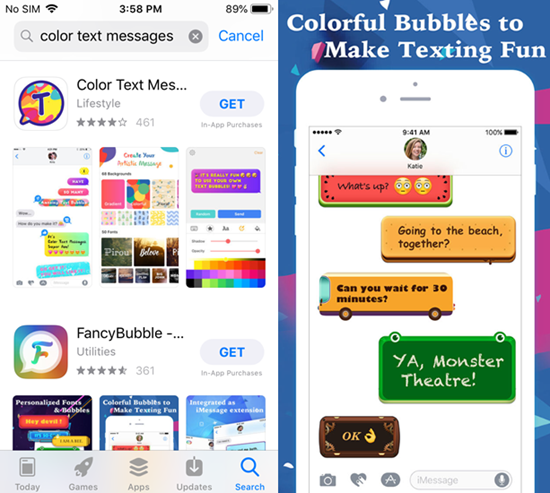 Then, the App Store will show you a lot of cool messages app which is designed to give you colorful background, various interesting effects, colored texts, designed bubbles and different types of fonts, etc. If you don’t know which one is the best, check the introduction and the reviews of these apps. Step 3. From this list of Message app, select one and install it on your iPhone. From it you will find an option to change the background of iPhone message easily. We know that Apple restricts its users from some access mainly for security reasons or alike. And that’s why many users rather jailbreak their iOS device to customize their phone individually. Many new iPhone users may not know about Cydia, an alternative app store for the jailbroken iOS device. With it you can download your desired SMS application if you have a jailbroken phone. And with the help of this, you can easily change the Messages app background on iPhone. After your iPhone is sucessfully jailbroken, download and install Cydia on your iPhone. Launch Cydia, and key “SMS/Desktop Background” in the search box to get your desired app. After getting this, tap on “Install” then “Confirm” to finish its installation on your iPhone. Then launch it. 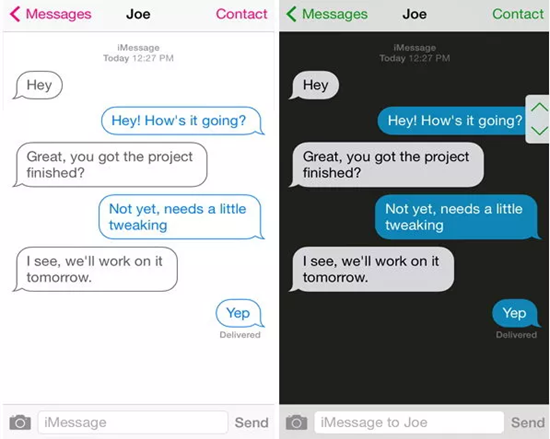 Now you can start to change the text message background on iPhone. Go to the app settings and find the “Wallpaper” option, select the wallpaper you want to use, then click on the “i” icon top left of the picture to apply the changing. Now the background of your iPhone Messages app has been changed. You can enjoy texting with your favourite backgournd on iPhone from then on. Install and launch Jihosoft iPhone Data Recovery on your Win/Mac PC. Select “Messages” among various file types and connect your iPhone to PC. Scan your iPhone and recover your deleted iPhone messages. Though sometimes it’s good to have a jailbroken iPhone, it’s not recommended for anyone to jailbreak their phone if unnecessary, for it will break the warranty and even brick the device. Still we hope that our guideline on changing the Message or iMessage background on iPhone will help you achieve your aim successfully. Please let us know if you have any question; we are early waiting for your response. Besides this, you can contact us for any information, inquiry or solution regarding the iOS related issue. Your opinions are always welcome here.